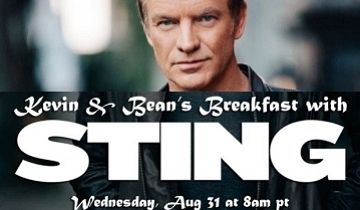 We’re pleased to announce Kevin & Bean’s Breakfast with Sting on Wednesday, August 31st in the Red Bull Sound Space at KROQ! In July 2016 Sting announced that he’d be releasing his first rock album in years, titled 57th and 9th, on November 11th. Win your way into this intimate event by tuning in to The Kevin & Bean Show all this week and next, plus you can enter our online contest below for another shot to score access to this private show! We’re pleased to announce Kevin & Bean’s Breakfast with Sting on Wednesday, August 31st in the Red Bull Sound Space at KROQ! In July 2016 Sting announced that he’d be releasing his first rock album in years, titled 57th and 9th, on November 11th. Win your way into this intimate event by tuning in to The Kevin & Bean Show all this week and next, plus you can enter our online contest below for another shot to score access to this private show!